This weeks featured Built by You project is courtesy of Todd Fratzel who runs the blog, ToolBox Buzz. Todd recently built a new workshop in his attic which would be any woodworkers dream. 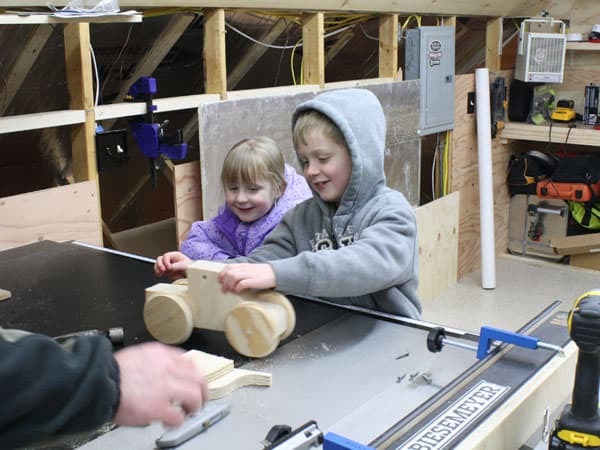 His kids have taken notice and this weekend they decided to “initiate” the new shop with a project of their own by building a toy truck. They built this toy truck with some scrap wood found laying around the shop. Todd had some “wood circles” floating around the shop from a large hole saw and his son asked him if they could build a truck. So that’s just what they did! Jigsaw to cut out shape. I did this part after the kids helped me draw out the shape they wanted on cardboard for a template. They both got a chance with my help to drill holes and screws. We screwed 3 pieces of scrap 3/4″ plywood together after the shape was cut out 3 times. They helped me drill the holes in the wheels and truck body. We used dowels for the axles. They helped me measure the length and cut them with a small coping saw. It was fun, they learned how drills can drill holes and put in screws. Lastly they learned what sand paper is and how it makes wood feel “soft” and smooth.